Volatile. Unpredictable. Erratic. I have used all those adjectives to describe market conditions for Austin/Central Texas residential real estate over the past few months. They all apply, and 2011 will call for ongoing analysis and forecasting. New construction and newly issued building permits should give us a glimpse at the future, however. 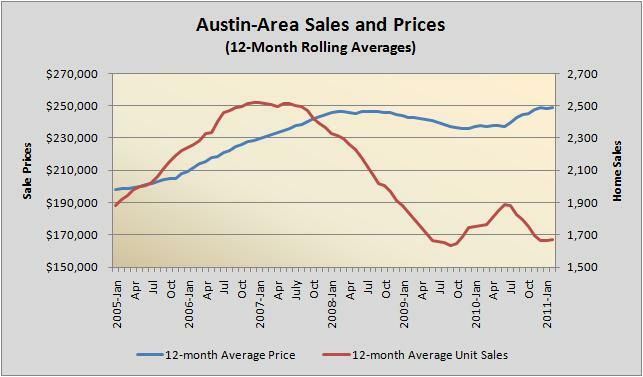 I commented earlier this week on recent home price trends, so this seems a natural place to continue thinking about what 2011 holds for the Austin area. 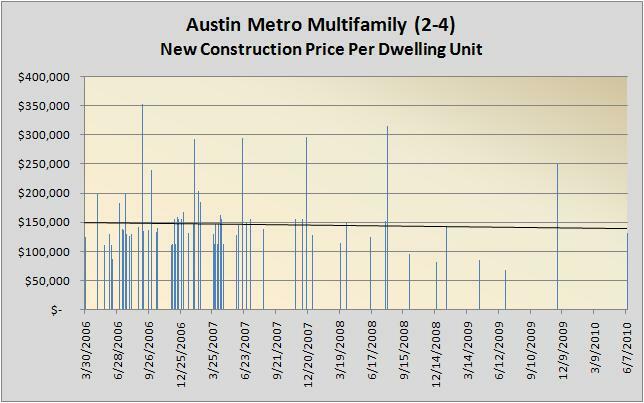 My Austin Market Dashboard discusses this in considerable detail, but for the purposes of this post, suffice it to say that unit volume is down substantially since the market peak, but home values have remained surprisingly stable — even appreciating through most of the recession. Again, home values held relatively stable, but unit volume is obviously down, especially since the end of the last homebuyer tax incentive program last June 30. Yes, you see that correctly: a total of six new multifamily structures — 3 duplexes and 3 fourplexes — were sold in the past two years. There have been no sales in this segment in the past nine months! 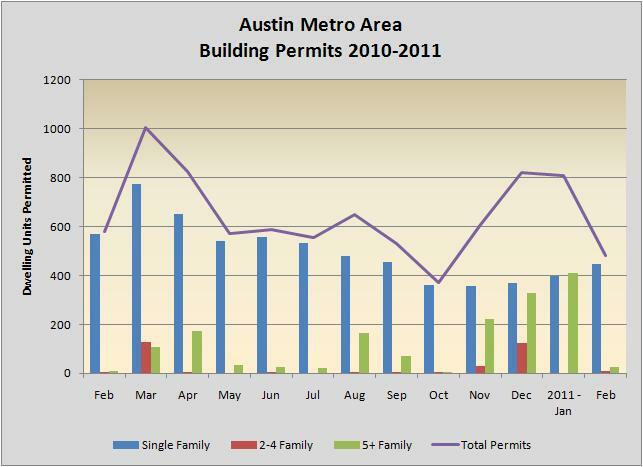 Note that this chart includes 5+ Family properties — apartments — and that is where we find the most impressive feature: Permits issued just in November 2010 through January 2011 totaled more than 80% of all permits issued in the entire year 2010. This sector had been so slow earlier in the year that this late surge only brought the 12-month total up to 78% of permits issued in 2009, but it does represent renewed confidence in the rental market 2012 and beyond. Somewhat shorter term, there was also an impressive surge in permits issued for 2-4 Family properties — 302 dwelling units approved in the past twelve months, compared to 31 in all of 2009. That’s a 974% increase! Construction of single family dwelling units — houses, condos, townhouses, and lofts — will remain slow this year: Permits issued over the past 12 months represent only 89% of the total issued in 2009. In this case, the local housing market will be well served by this conservatism. It will allow resale activity to absorb most demand and support stronger resale values than if builders were aggressively adding inventory. 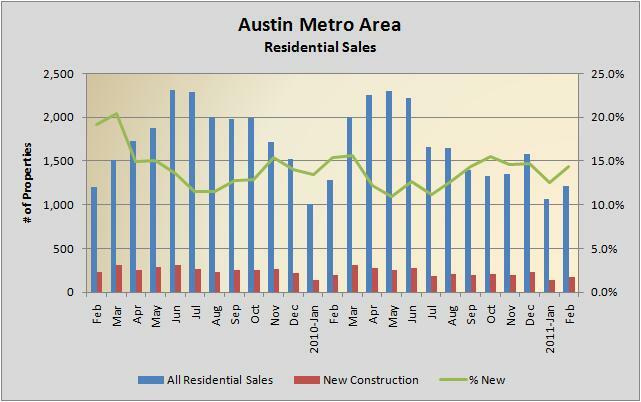 We do not see across the board optimism for the Austin/Central Texas residential market in these figures, and given the uncertainties presented by the national economy that makes sense. 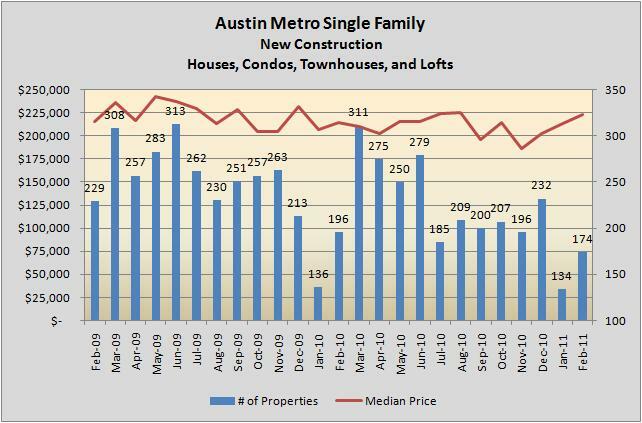 I have noted before that the Austin area continues to enjoy growth in population and jobs, but home purchases by those newcomers may well be delayed by their inability to sell homes elsewhere (or reluctance to sell at the reduced values that many markets have seen). Even more who could buy may simply choose to avoid homeownership until they see a clearer economic future. 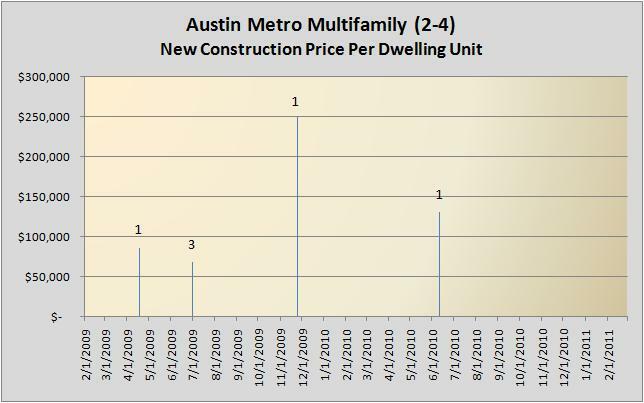 These trends should begin to correct later this year and growth should gain momentum in 2012 and beyond, but in the short run new Austinites in those situations will be renters. That is what this data shows: Confidence that there will be demand over the next couple of years for a larger supply of rental homes — apartments and smaller multifamily properties. Building permits should lead to construction starts and property sales in those sectors. The coming months will show whether investors’ confidence is well-placed at this time. Assuming that they are right, then renewed single family construction will follow and our next market growth cycle will begin in earnest next year.